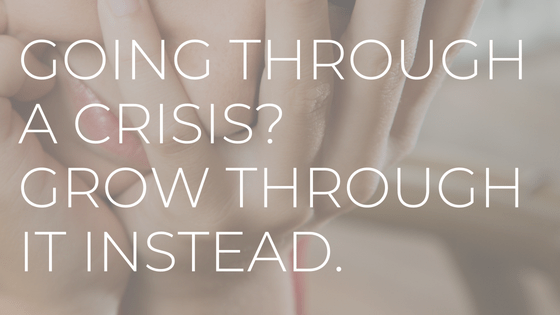 Ever been through a crisis? We all have. Stuff happens! We’ve all had to deal with unplanned, poorly timed and, most definitely unwanted circumstances in our lives that throw us completely off course, and leave us stunned, scared, confused, exhausted, drained and depressed. It may be a job loss, financial setback, the loss of a loved one, a relationship ending poorly, a terrifying medical diagnosis, a business going broke or a host of innumerable other possibilities, perhaps even a combination of many. These challenges are often accompanied by an overwhelming and relentless sense of despair and hopelessness where, at their extreme, we may question whether we want to continue battling for even one more day. There is no solution in sight. We have nothing left to give. And we just don’t want to go through this anymore. Stop going through it. Yes, that may sound flippant. But I don’t mean you should ignore your circumstances. Instead, accept your crisis for what it is. Wishing it will go away will not make it go away. Acknowledging the irrefutable facts, and asking yourself intelligent questions about them is the best way to take back the power over a difficult situation. That’s the solution: Don’t go through it, grow through it. Immersing ourselves in the problem serves only to spiral ourselves deeper down into despair, and robs us of the opportunity to seek the best solution and take the best action. The temptation to shrivel up and die – to give up – in order to make the stress go away rarely provides much more than a brief respite. The same challenges will almost certainly rear their ugly heads again. This time, bigger, deeper and more intense. Think about it: by avoiding the issue, we actually exacerbate it. By choosing to grow through it, we also open ourselves up to an awareness of our own resourcefulness, thus positioning ourselves for creativity to see things differently, discover new ways of meeting the challenge and walking away the winner. By thinking of ourselves as having to “go through it” we are feeding ourselves a story that transitions from being fiction to our true reality, along with all the negative emotions that accompany this mindset. When we decide instead to grow through it we are setting ourselves up for an experience of enlightenment, development and accomplishment. The progress may be slow – perhaps years – but the time will come when our perseverance will be rewarded and all doubts about ourselves and our abilities will evaporate. That is the moment you will have grown through it, not gone through it.